The global meat tax… how Rickards got his rate call right all year… when gold won’t help you… and more! How surreal is this? The U.S. factory sector is now its weakest since the “Great Recession”… and the Dow is up 100 points as we write. It being the first of the month, the ISM Manufacturing Index is out this morning. 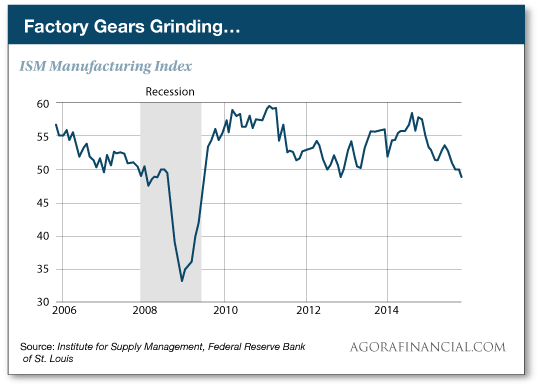 As a reminder, readings below 50 indicate a factory sector that’s shrinking, not growing. The November number rings in at 48.6 — lower than the lowest guess among dozens of economists polled by Bloomberg. It’s only the second sub-50 reading since mid-2009. But the overall trend is a steady down, down, down over the last 12 months. The internals of the report are also discouraging. New orders notched their lowest reading since mid-2012. And exports have been shrinking for six straight months, thanks to a strong dollar. Out of 18 manufacturing industries, only five show any growth. The weak links include several capital goods industries — machinery, primary metals, fabricated metals. The ISM number argues against the Federal Reserve raising interest rates when it meets in two more weeks… which might be why Wall Street is rallying today. For most of the last six years, bad news about the economy has been good news for stocks because lousy economic numbers would juice expectations of continued easy-money policies from the Fed. That phenomenon has worn off in recent months as Janet Yellen and other Fed leaders keep talking about raising rates, even though they don’t follow through. On some days, bad news really is bad news again. But not today: As we write, the major indexes are all up a half percent or more. The S&P 500 rests at 2,092, less than 40 points below its record close last May. Who knows? Jim Rickards’ gutsy call on CNBC more than a year ago might still be proven out and the Fed won’t raise rates during 2015. If you were with us last week, you know Jim has shifted into the camp that figures the Fed will raise this month. But he was right throughout all this year — no increases — while conventional wisdom expected otherwise. How’d he get that call right? Jim said the Fed wouldn’t raise at all. And then June gave way to September. He was way out on a limb saying the Fed wouldn’t increase in September. But he was right. For the numerator on the right side — the top part of the fraction — you analyze new incoming information. The denominator represents all the possibilities you might be wrong. In addition, Jim noticed a bit of statistical sleight of hand the government used to make GDP in the third quarter of 2014 look super strong. “But to test that thesis, I had to continue monitoring the data,” Jim goes on. The problem with being right is the temptation to get cocky. But Jim resists that temptation, continuing to test his thesis against new incoming information. That’s why Jim said in this space eight days ago that if the Labor Department delivers a strong November jobs report — it’s due this coming Friday — the Fed will raise rates in December simply because the Fed has talked itself into doing so. A handful of readers called Jim out. One called him a “silly goose.” But Jim’s not going to be stubborn in the face of new incoming information — not when he’s got thousands of readers counting on him. And as we said earlier, Jim’s original forecast might yet prove out — thanks to both the weak ISM number and an eye-opening story posted this morning at Politico. Headlined “Could an ‘Accident’ by Janet Yellen Derail Clinton?” it describes Democrats who fret that a December increase might tank their party’s prospects next year. We’ll see. Fed chief Janet Yellen — a Democrat — is giving a big speech tomorrow and testifying to Congress Thursday. And as noted earlier, we’ll get the jobs report on Friday. Stay tuned. [Ed. note: It’s this ability to react to new incoming information that’s key to Jim’s unique “Kissinger Cross” tool. Readers like you have used this tool during 2015 to generate gains including 102% in four months… 150% in four weeks… and 162% in under six months. The aforementioned strength in the S&P 500 “masks what really is going on,” says our investment director, Chris Mayer. “Basically,” he explains, “five stocks made up more than 100% of the gains of the S&P 500 this year: Amazon, Google, Microsoft, Facebook and GE. If you take out those five, the S&P 500 is down more than 2% for the year. The classic approach of seeking out-of-favor, overlooked or misunderstood stocks hasn’t paid off this year. But that’s all the more reason to pay attention to this approach now, says Chris. Indeed, those stocks might prove the beginning of a 100 bagger — Chris’ ongoing quest in Mayer’s 100x Club. (If you don’t have a copy of his book 100 Baggers: Stocks That Return 100-to-1 and How to Find Them, our free book offer is still available. Enter the password “mayers100x” at this page and you’re in. “I find it interesting,” a reader writes on the topic of a proposed meat tax to combat climate change, “that anytime the governments of the world decide that they need to modify behavior, they determine that the best way to do that is to TAX something. “To me, it’s obvious that factory farming of meat is the culprit in meat contributing to climate change (not to mention it’s an incredibly cruel way to treat the hapless animals that become meat). If you ban factory farming, you force the raising of livestock back to a more natural process. This will, naturally, cause the cost of meat to rise, so most people will, naturally, eat less. And the government doesn’t make a dime. If they just start taxing it, factory farming will certainly continue and climate change will not be impacted. “Argentina just dumped their socialist Dear Leader, Cristina Fernandez de Kirchner,” writes one of our regulars. “Argentina had developed a massive dependent population over the past decade, just like socialist America under Obama, yet they just dumped their free-lunch, rhinestone commie leader. The 5: A timely inquiry you make. It was 14 years ago today Argentina’s government began imposing the infamous corralito — effectively freezing bank accounts and devaluing the currency. Before the corralito, the Argentine peso traded 1-to-1 with the U.S. dollar. Overnight, it became 3-to-1. It was the endgame after years of corruption and mismanagement under the center-right president Carlos Menem during the 1990s. Out of the post-2001-02 turmoil, Argentina got 12 years of even worse corruption and mismanagement under the Kirchners. Here at Agora Financial, we know of someone who lived through all of that — not least the widespread riots that followed 20 days after the corralito was imposed. His name is Fernando Aguirre. Fernando is cautiously optimistic president-elect Mauricio Macri can make a positive difference. “Now there’s a president that will work toward fixing things rather than filling his own pockets,” he writes at his blog. “Our world was suddenly transformed,” Fernando writes of events 14 years ago in a “secret survival journal” he’s written for an audience who worries the U.S. dollar is headed down the same road as the Argentine peso. Let’s be blunt: Most of the “prepper” literature out there is written by people who’ve never experienced a full-on economic collapse. We’re talking the sort of collapse that makes 2008 look like a day in the park. The sort of collapse where gold and silver won’t buy you any necessities… because you’ll likely be kidnapped the moment anyone knows you’ve got them. The 14 rules of bartering and haggling — with potential murderers and thieves. Sometimes you don’t have currency — just supplies. But bartering is a dangerous game after society has fallen apart. If they do like what you have…what’s to stop them from just taking it? These 14 rules can help keep you safe when “trading” with the criminal element. We’re sufficiently impressed that we’re giving away 3,000 copies of this secret survival journal — free. Check it out right here. P.S. Just in: Jim Rickards’ “Kissinger Cross” indicator is showing it’s go-time on a trade with the potential to double or even triple your money within the next year. To learn more about how this unique indicator works — it has a history going back to 1981 — and how to start profiting from it today, give this a look.